The recent FDA approval for gammaCore using acute treatment of migraine was based on a randomized, sham-controlled prospective study of nVNS for the acute treatment of migraine (PRESTO) study. 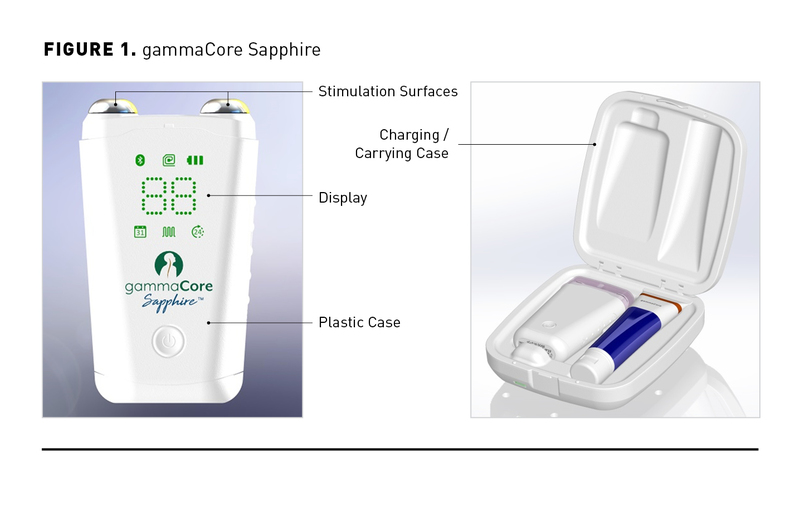 It demonstrated superiority of gammaCore adjunct to standard of care (SOC) over sham with SOC.3,15 The cost-effectiveness of gammaCore compared to SOC is documented and shown to be dominant (ie, gammaCore was more effective while costing less, [United States and Germany] and cost-effective [United Kingdom] for cluster headache).16-18 The cost-effectiveness of gammaCore for migraine treatment remains unknown and needs to be characterized. 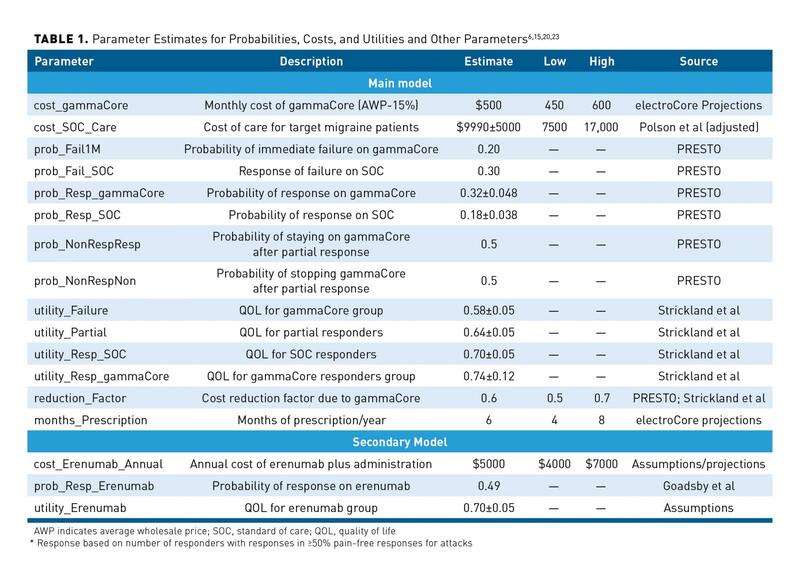 We performed a cost-effectiveness analyses of gammaCore adjunct to SOC for migraine compared to SOC alone and assessed the cost-effectiveness of treatment sequence strategies. The model approach and structure were based on treatment of acute attacks to yield 3 potential outcomes–failures, partial responders, and persistent responders.22,23 Failures were those patients who experienced lack of adherence or lack of efficacy, and the proportion of responses to treated attacks (no pain within 30 minutes with no use for rescue medications) was 0%. GammaCore patients who failed were immediately identified using 1 or 2-month prescriptions with no further refills. Partial responders are patients who experienced partial efficacy, with the proportion of responses to treated attacks between 1% and 50%. These patients could be retrained to yield additional responders, additional failures, or remain as partial responders. Responders were patients who met the equivalent of PRESTO trial outcomes. The proportion of responses to attacks ≥50% (pain free) did not need other medication. Individuals in each outcome could remain in the same outcome group. In addition, failures could be offered erenumab. The model structure is shown in Figure 2. The decision tree model parameters were populated with data from the PRESTO trial providing the base case parameters.15 Cost data were derived from Polson et al and economic considerations driven by data from Strickland et al.20,23 Additional insights, including event rates for erenumab, were drawn from literature.6,24 The models were designed from a payer perspective with a time horizon of 1 year and built using Tree Age Pro–Healthcare (2018 R1, Williamsburg, MA). Uncertainty was incorporated by using distributions around parameter estimates for treatment effects, costs, and utilities. In addition, 100,000 trials (Monte Carlo simulations) were performed to yield a mean estimate of costs, effectiveness, and incremental cost-effectiveness ratio (ICER). A range of sensitivity analyses were also performed to evaluate the robustness of the model and test the impact of modifying parameter estimates on the models output. The decision trees are shown in Figures 3a and 3b. The model outputs were ICERs for cost per QALY. 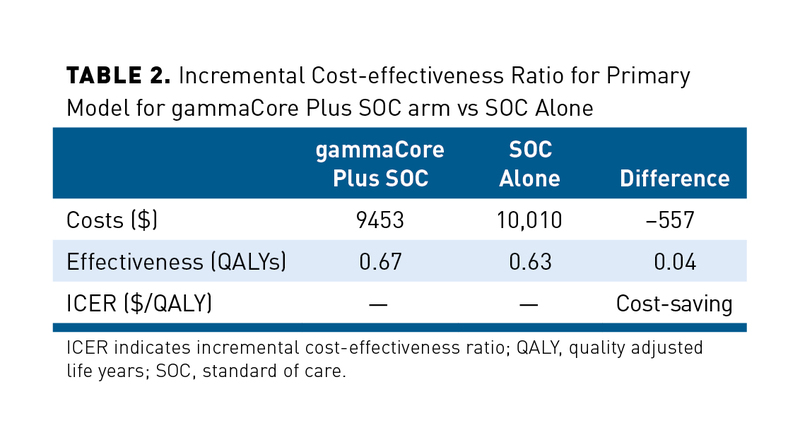 These were derived from the difference in overall costs between gammaCore plus SOC (CgammaCore) and SOC alone (CSoC), and then divided by the difference in effectiveness, and QALY between gammaCore plus SOC (EgammaCore) and SOC alone (ESoC). The approach was similar for the secondary model. We compared gammaCore-based sequences to corresponding SOC-based and non-prerequisite sequences, as well as corresponding erenumab-based sequences. A series of 1-way deterministic sensitivity analyses were performed for high and low values shown in Table 1. Additional probabilistic sensitivity analyses were performed. The annual mean costs for gammaCore plus SOC arm (CgammaCore) was $9543, and for SOC alone (CSoC) was $10,010. The mean QALYs for gammaCore plus SOC arm (EgammaCore) was 0.67 and for SOC alone arm (ESoC) was 0.63. Thus, gammaCore plus SOC arm was dominant (ie, was more effective but cost less) over SOC alone. See Table 2. The annual mean costs and QALYs for gammaCore followed by erenumab were $10,678 and 0.70, respectively, while the annual mean costs and QALYs for SOC followed by erenumab were $11,583 and 0.67, respectively. The mean costs and QALYs for initiating erenumab with no prior gammaCore or SOC treatment were $13,766 and 0.65, respectively. GammaCore followed by erenumab for failing patients was dominant over all other strategies, as shown in Table 3. All results of the 1-way sensitivity analyses were cost-effective, with a conservative willingness-to-pay threshold of US $20,000. The results of the series of 1-way sensitivity analyses are shown in the Tornado Diagram in Figure 4a. The most influential factors in the one-way sensitivity analyses were the cost reduction factor, the number of months of prescription per year, and the cost of SOC care for high-demand migraine patients. More than 95% of simulations were cost-effective at a threshold of $40,000. 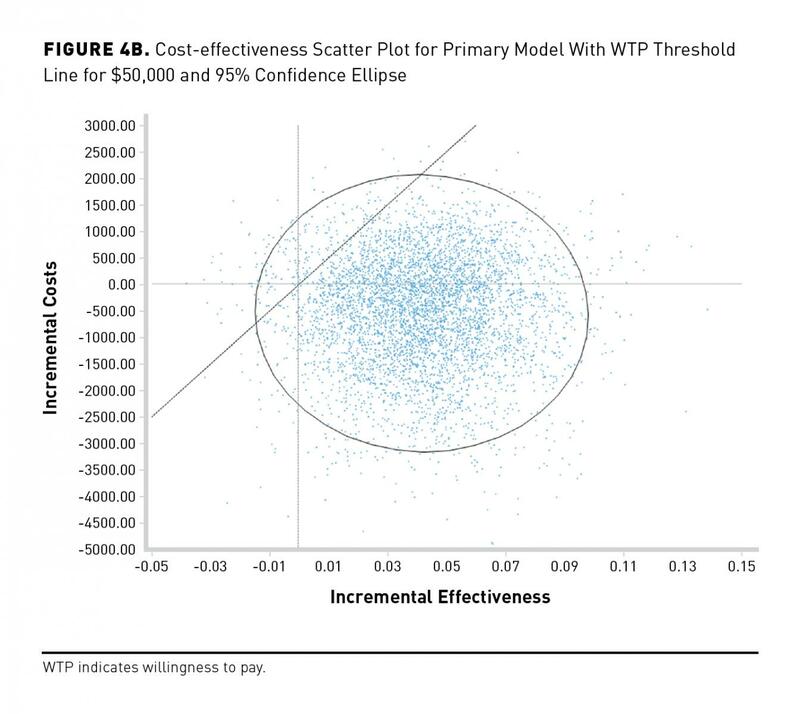 The cost-effectiveness scatter plot and acceptability curve are shown in Figure 4b and Figure 4c. 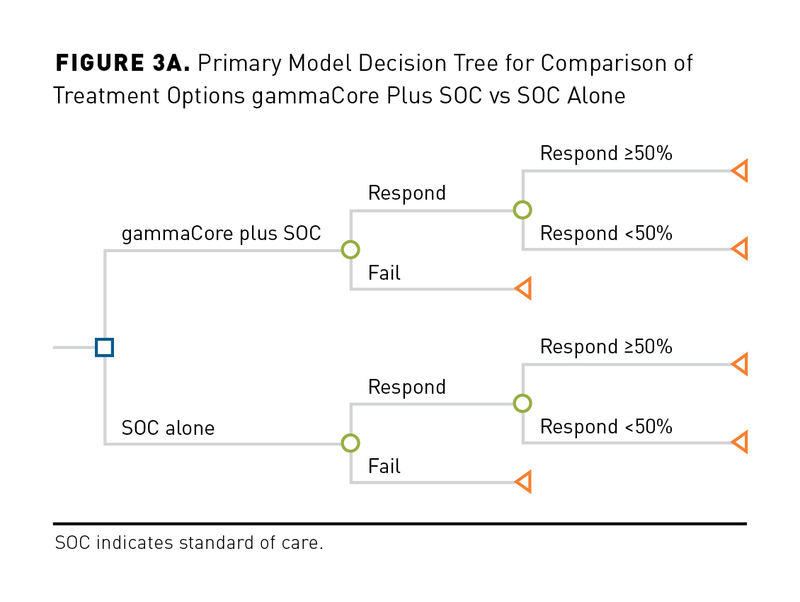 As the primary model of this research compares treatment options for gammaCore versus SOC, the secondary model is a more complex comparison of strategies for the overall approach of a patient rather than the individual selection of treatment options. Current payer coverage for onabotulinumtoxinA, for example, is conditional and restricted to patients with 15 or more headache days per month who have failed 2 or 3 treatment options, depending on specific plans.36,37 Such policy strategies are typically reserved for costly, higher tier, usually injectable or invasive treatment options, among which onabotulinumtoxinA is included. Similarly, CGRP receptor inhibitors, such as erenumab and fremanezumab, would likely fall into this category. As monoclonal antibodies, they are projected to cost approximately $6900 annually ($5000 with an expected 27% discount). 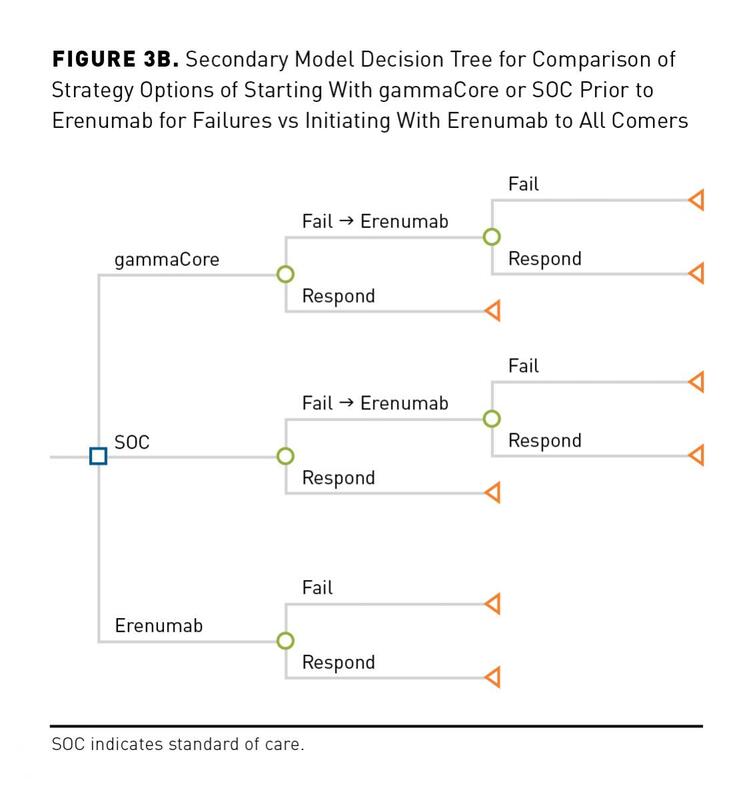 The secondary model finding in this study affirms that initiating erenumab only after patients fail SOC or gammaCore are more cost effective than starting patients on erenumab straightaway, with the gammaCore-based sequence being the most cost-efficient. Also, as preventive agents, with their effectiveness measured as reducing frequency of headache days, typically a reduction of 50% or more is considered responsive. Although this is a major benefit to the patient, it also means that many patients remain with symptoms and, thus, QOL is not completely improved. Patients may need to continue to use acute treatment options, including gammaCore for the residual attacks. Another key point is that, while these preventive agents are efficacious, and response can be acknowledged relatively rapidly, for example within 3 months, it still takes 9 to 18 months to determine whether the preventive medication has failed. The costs incurred on the medications for the 9 to 18 months are significantly more compared with costs incurred on gammaCore, where treatment failure is determined within 1 or 2 months, thus saving payers. Finally, gammaCore Sapphire has incorporated RFID-based dose loading and wireless Bluetooth technologies for seamless communication with other devices including laptops, smartphones, and other mobile devices as well as server- and cloud-based services. This unique attribute allows for passive monitoring of dose usage and the occurrences of clinical events and outcomes for strategic future real-world data assessments. GammaCore therefore provides a data monitoring platform for pay-for-performance strategies and coverage policies. 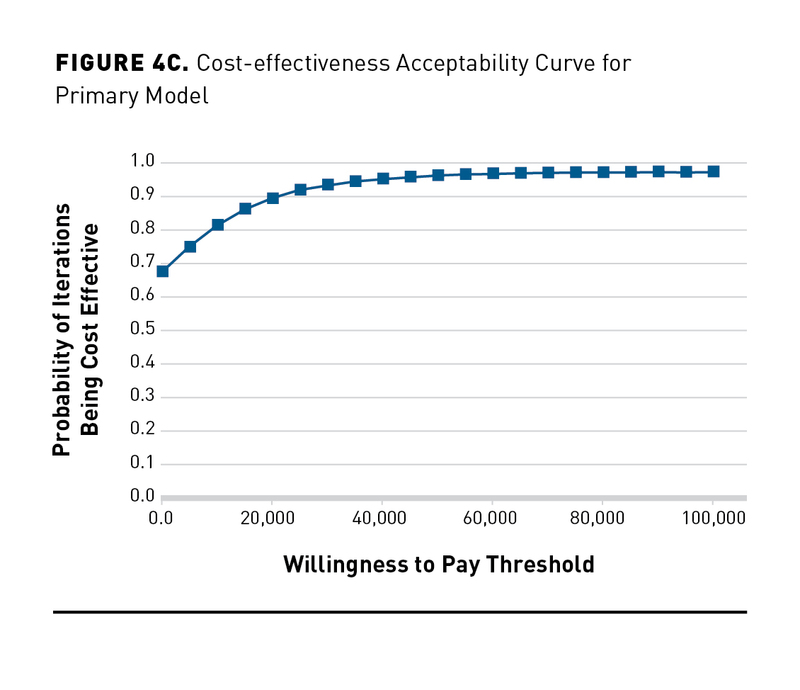 Pay-for-performance strategies could take advantage of optimized patient selection, follow-up, and long-term care at no or minimal additional cost, which is not as effortlessly possible when using pharmaceutical options. This presents further incentive for stakeholders, including payers, to make gammaCore even more cost-effective and economically attractive. The importance of successful and consistent treatment of migraine has recently been reinforced with the long-term findings that migraine sufferers are associated with increased risk of cardiovascular diseases in addition to what is already known regarding numerous other comorbidities. Strengths of this analysis include the model designed and conducted to current accepted recommendations and standards.19 The parameter estimates were mostly derived from primary patient-level data from randomized, double-blind, sham-controlled trials. The models are simple and transparent designs and their execution account for treatment failures in addition to responders and partial-responders. 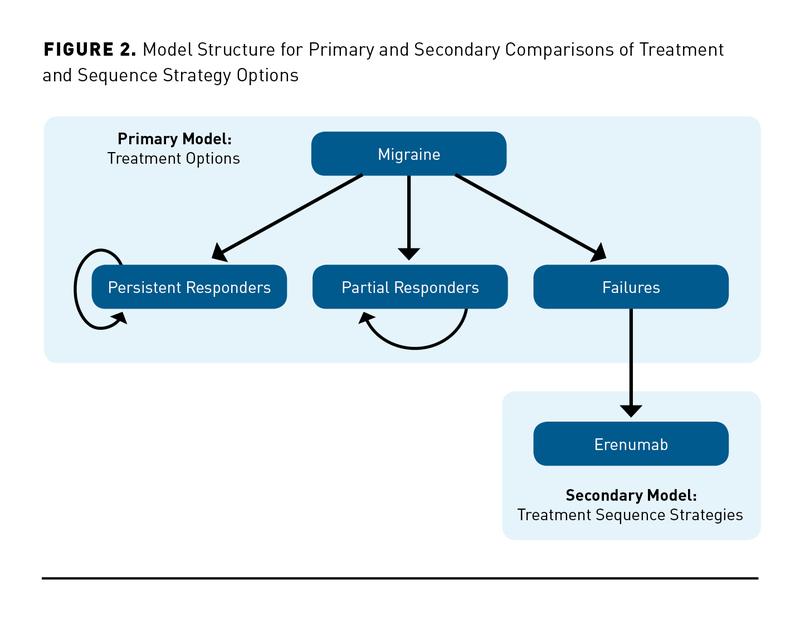 Acute treatment response was based on pain-free outcomes.38 The design maps realistic high-demand migraine patient care and tests extensive sensitivity analyses, such as deterministic and probabilistic approaches. The cost estimates used were based on itemized data on specific medications and dosages as available. Estimates that are based on assumptions are supported by evidence.20,23 A potential weakness is that there is no comparative cost data for less expensive options that are also less effective oral preventative treatments. 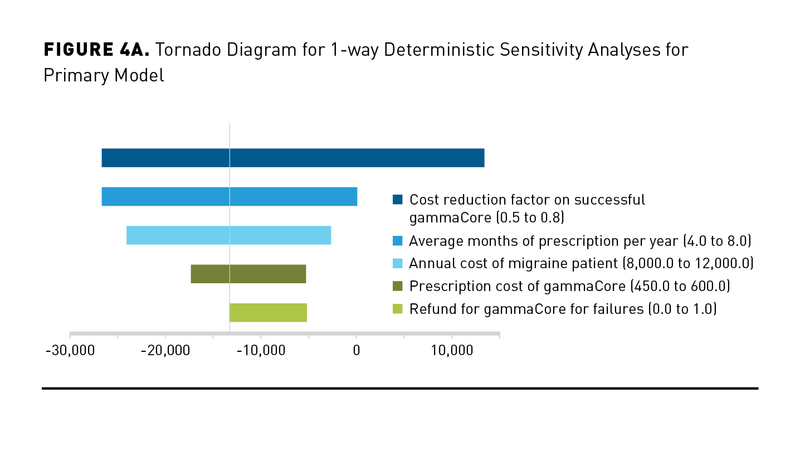 Given that gammaCore is clinically superior to SOC and is cleared by the FDA, it significantly adds economic value for the acute treatment of migraine. Because gammaCore is dominant, its use represents savings to payers and patients as a treatment option and a component of treatment sequence strategies involving back-up preventive agents. These findings serve as additional robust economic evidence to support the need to update current migraine treatment guidelines and patient coverage policies. Additional real-world data are needed to characterize the long-term impact of gammaCore on comorbidities, utilization, QOL, economic outcomes, daily functioning, productivity, and social engagement of these patients.